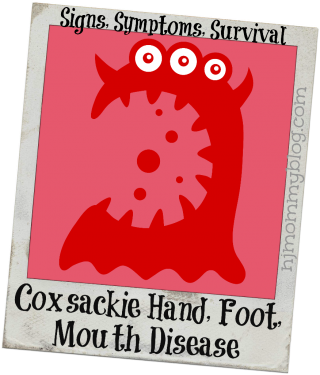 Coxsackie virus can cause Hand, Foot, Mouth Disease, an evil viral virus that recently struck my toddler, G, like a ton of bricks. This virus came on fast and it meant business. It produced painful blisters on G’s tongue, mouth, and throat, hands and feet, high fevers, and resulted in total toddler misery. The week G battled this virus is a week I want to forget and a week I’m glad she’s too young to remember. After reading the increasing Facebook comments and shared articles about this common summer virus, I was on high alert. One way coxsackie is spread is from person to person on unwashed hands and surfaces that have been contaminated by feces. Ehk! The virus can spread rapidly in communities such as at parks, camps, schools, and public pools. We had joined the latter for the summer. Famous last words. The next day coxsackie struck. From what I’ve read, each case of the coxsackie virus can be very different, varying in degrees and symptoms with each child. Here are the signs and symptoms my daughter (15 Months Old) experienced and how I helped my little one cope. Apparently there is a 3-6 day incubation period for this virus. I’m not sure when exactly G was exposed, but she spent two full days acting under the weather as the virus worked on her. She was irritable, slept more than usual (two two-hour naps a day), and her body felt very warm to the touch even though she was not running a fever. At night her sleep was interrupted. She woke up a few times, but put herself back to sleep. G is up most of the night restless and crying; something is obviously bothering her. She is running a low grade fever. G wakes up in the morning with two small red dots on the outside of her mouth. They look like two small pimples. She has a low grade fever about 99. qShe picks at breakfast, unusual for her. She’s uncomfortable and irritable. I check in with her pediatrician describing the red dots by her mouth, fever, and behavior. She confirms my suspicion. 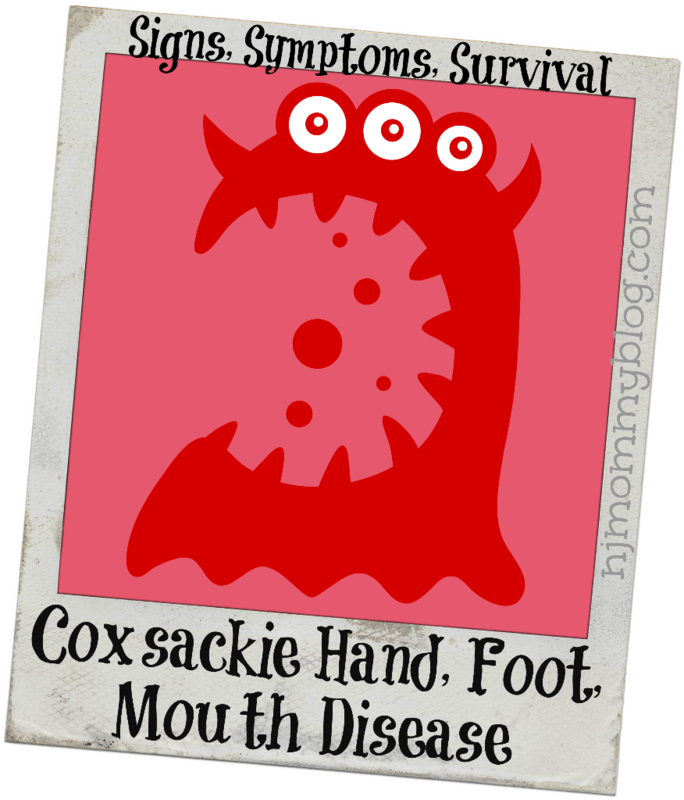 It’s Hand, Foot, Mouth Disease and it’s going to get worse before it gets better. It gets worse…G develops a giant, painful blister-like sore in the center of her tongue and small, red blisters along the roof of her mouth by the back of her throat. She also develops a few small blisters near her toes and one or two by her fingers. Her fever increases 99-103…even with Infant Tylenol. She wants nothing to drink, nothing to eat, and just keeps crying. It seems there’s not much my husband and I can do to comfort her, but we try everything. The worst. Fever peaks at 104.3. This is downright scary. G is inconsolable. She is screaming crying and obviously feels miserable. She is shaking with chills and boiling hot. Nervously, I call the pediatrician to check in and the nurse advises me to alternate between Infant Motrin and Tylenol to bring down the fever. (I contemplate alternating between Vodka and Jack for my own anxiety relief.) She also suggests getting G into a cool bath or applying cool compresses on her head. I try both but it’s a disaster. G wants nothing to do with either and it sends her into total meltdown mode. She’s also refusing to put anything near or in her mouth so oral medicine is a joke. She’s screaming and spitting out doses of medicine so I have no idea how much she has gotten. No sleep for anyone Monday night and lots of worrying. We feel so, so bad and helpless. I know she’s in pain and it’s heartbreaking. Plus, I’m worried about her getting dehydrated. I stay with her in her room all night doing anything I can to comfort her. G still refuses to eat or drink anything. She screams if I even put her near her chair in the kitchen. Her fever has come down a bit, but the tongue blister is big and looks worse. I try to give her anything liquid or solid she might be interested in-milk, a smoothie, yogurt, oatmeal, ice cream, ice pop, banana-no luck. Finally, I have some success with plain water. I fill the Tylenol syringe with water and play “water gun” squirting it into her mouth as she sits on my family room carpet drowsily watching Mickey. Hey-whatever works. Her fever continues to go up and down and I continue alternating doses of Infant Tylenol and Motrin as best as I can. She sleeps a little on and off, and by night eats some watermelon. I end up soaking a watermelon slice in a dose of Tylenol and finally feel confident she got a full dose. Again-whatever works. It’s another sleepless night, but the fever seems to be staying lower around 100/101. Seeing some improvement. Fever is lower 99/100. Blister pain in her mouth is still high. I get her to eat an ice pop and fill some of the plastic sleeve with Infant Tylenol. It works and she eats the ice pop and gets dose of medicine. Her tongue/mouth blisters look like they’ve started the first stage of healing-white has formed around them. G’s exhausted. By nighttime, she has some yogurt and later some watermelon. We let her eat/drink and do whatever she wants, which isn’t much aside from wanting to be held. The worst is over. Fever down. Blister healing continues. G gradually starts to eat more, sleep more, and the blisters continue to fade. I ask the nurse how long she’s contagious; as long as she has gone 24 hours without a fever and the blisters are scabbing over/healing she is no longer contagious. We stay put in the house until Sunday just to be on the safe side. I’d hate to pass this thing on to anyone! John and I notice we have a few small sores in our mouths and think it’s our bodies fighting the virus. That’s all that comes of it and we stay healthy. If you feel like you want more technical information about Coxsackie Hand, Foot, Mouth Disease, here are two websites I found helpful.